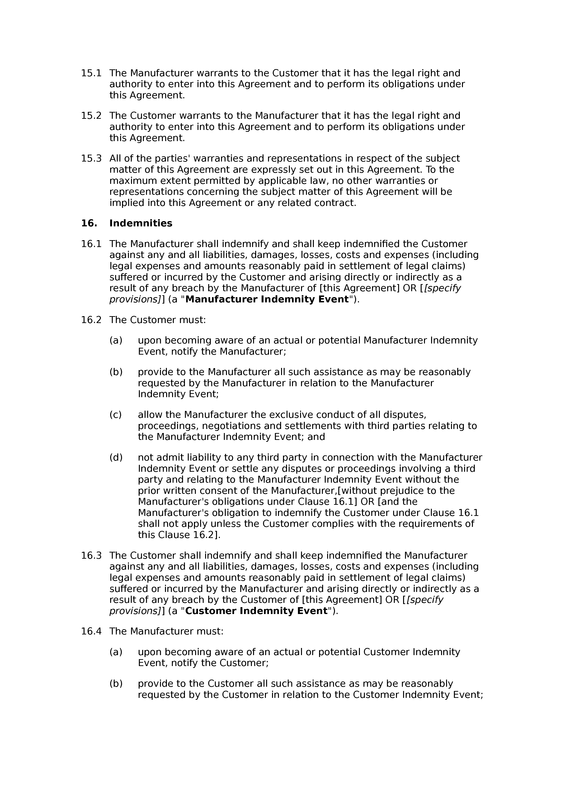 This is a manufacturing agreement, under which the manufacturer is obligated to produce and supply products that are specified by the customer. 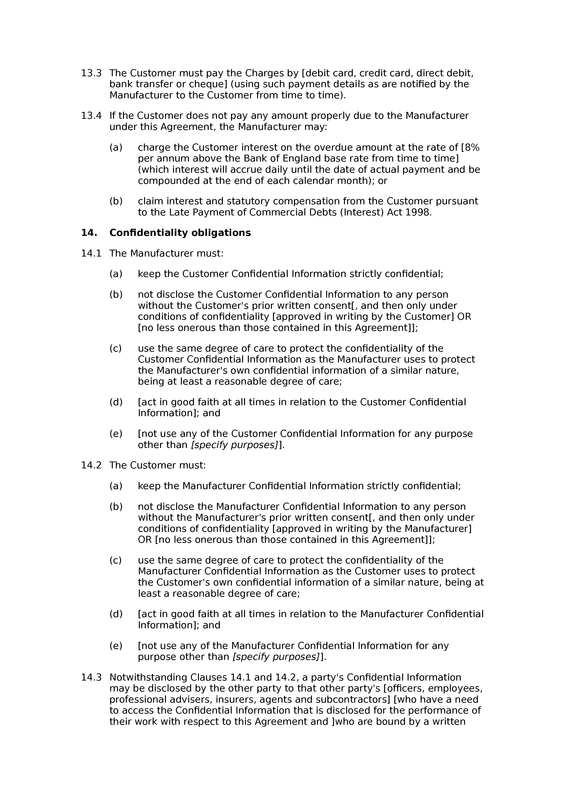 Typically, a detailed product specification will be provided, and this may be incorporated into the agreement or supplied as and when required by the customer. 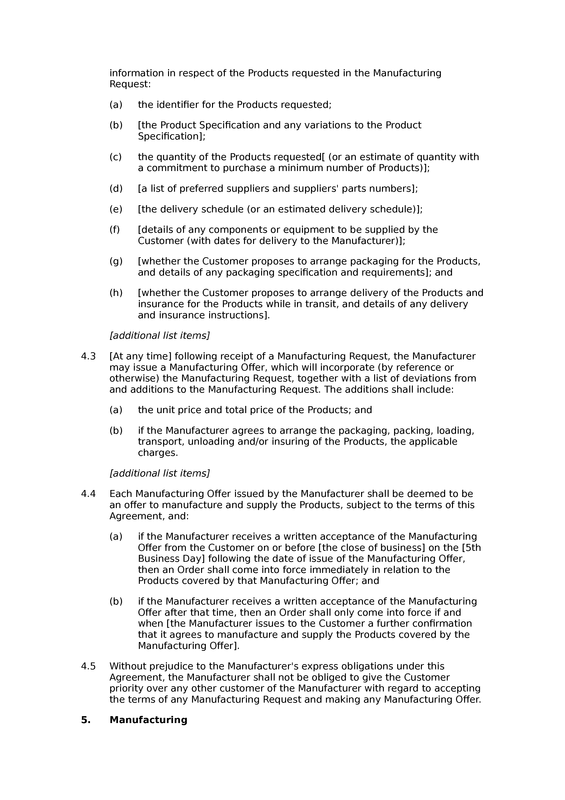 In addition to the core manufacturing provisions, this agreement includes a schedule setting out the legal basis upon which the products are supplied. This schedule covers delivery (or collection) of the products, title to the products, risks in transit and so on. 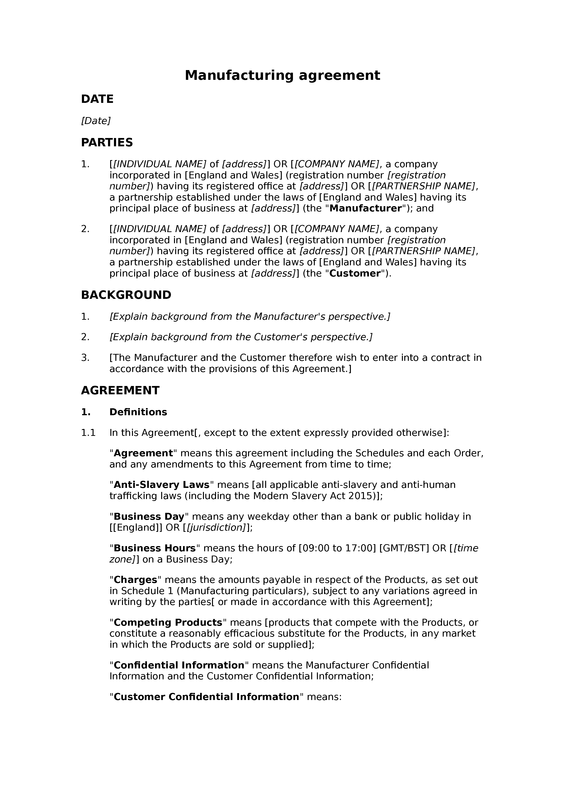 This document is identical to our standard manufacturing agreement, except that it includes text attributing the document to us. 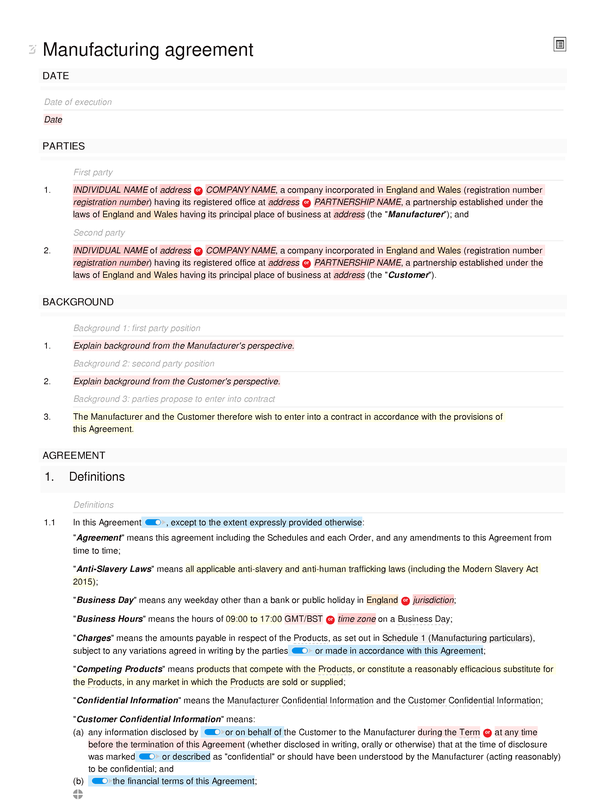 If you want to use the document without that text, you should purchase the standard agreement. 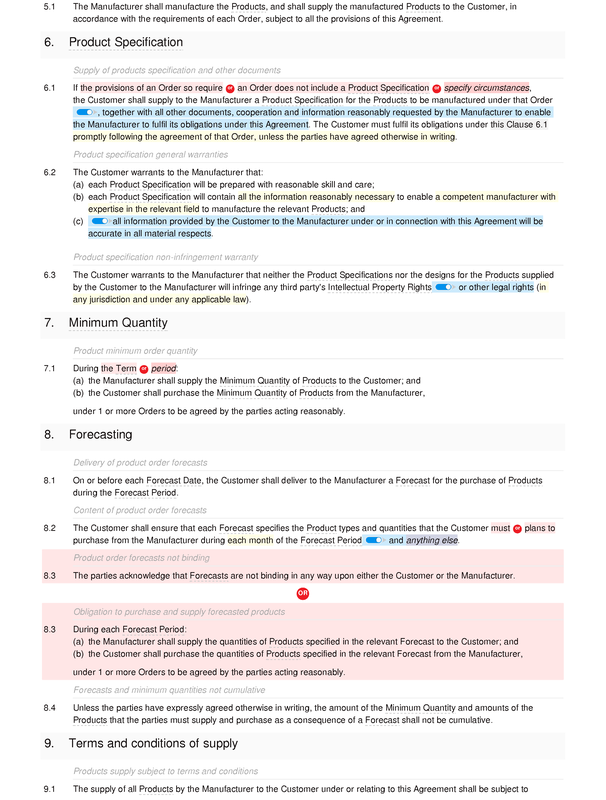 Order procedure: pre-order negotiations for manufacture and supply of products; manufacturing request; manufacturing offer; manufacturing order; no priority over other customers for manufactured products. 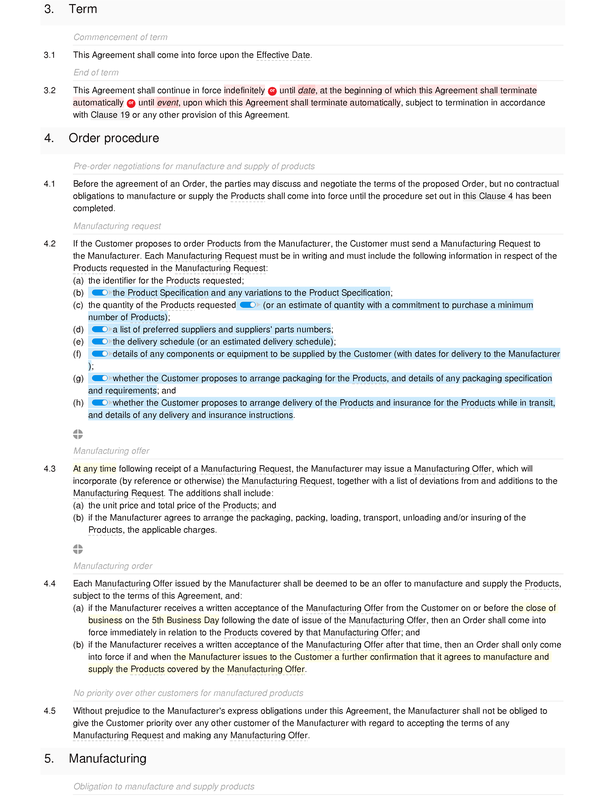 Manufacturing: obligation to manufacture and supply products. Product Specification: supply of products specification and other documents; product specification general warranties; product specification non-infringement warranty. Minimum Quantity: product minimum order quantity. 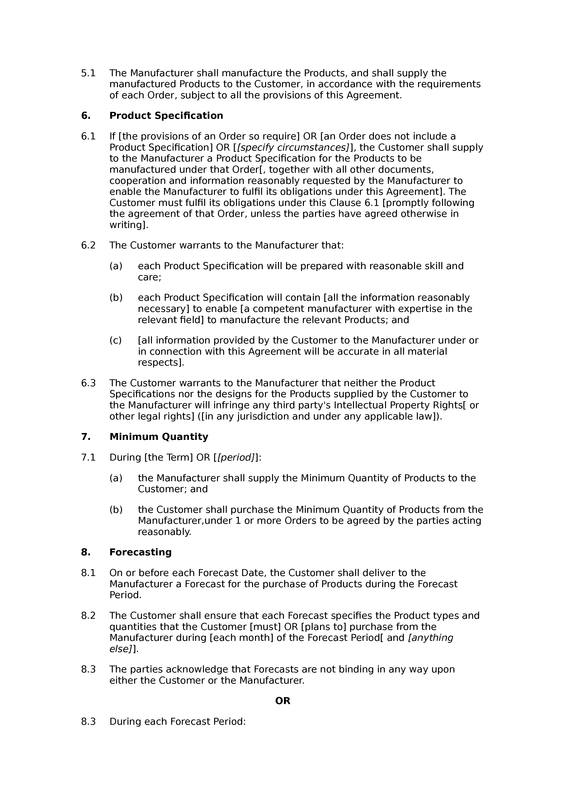 Forecasting: delivery of product order forecasts; content of product order forecasts; product order forecasts not binding; obligation to purchase and supply forecasted products; forecasts and minimum quantities not cumulative. 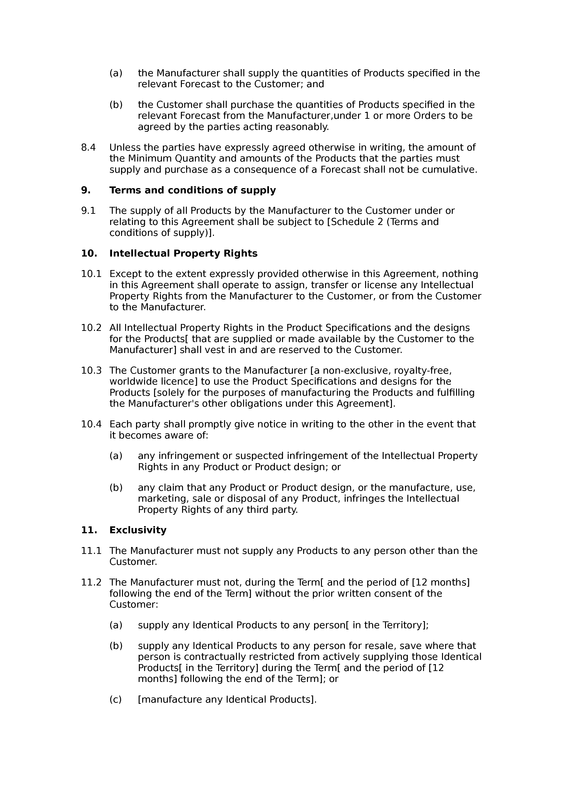 Terms and conditions of supply: products supply subject to terms and conditions. Intellectual Property Rights: no implied assignment or licence of IPR; IPR in products: reservation; licence of IPR in product specifications and designs; parties to notify IPR infringements. Exclusivity: exclusivity re product supply; exclusivity re identical product supply; exclusivity re competing product supply. No exclusivity: no manufacturing exclusivity. Charges: obligation to pay charges; amounts inclusive or exclusive of VAT; increases in charges for products. 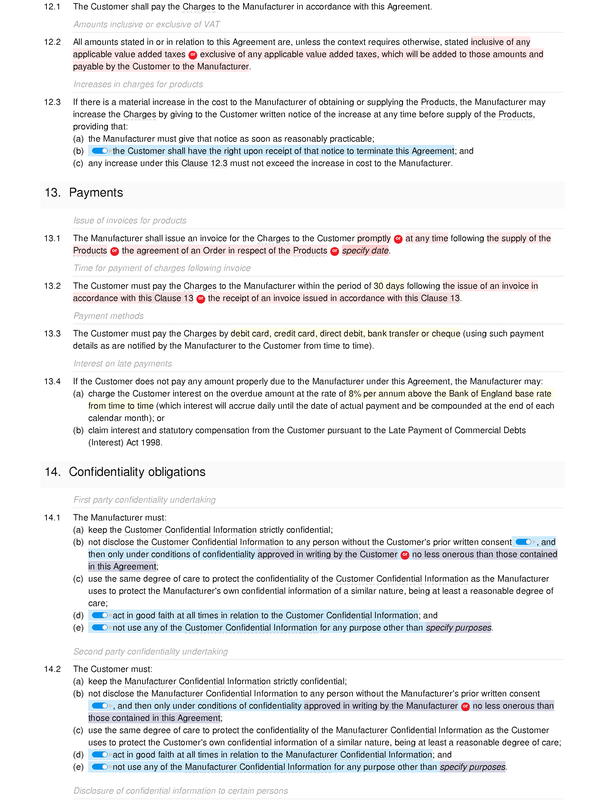 Payments: issue of invoices for products; time for payment of charges following invoice; payment methods; interest on late payments. Confidentiality obligations: first party confidentiality undertaking; second party confidentiality undertaking; disclosure of confidential information to certain persons; exceptions to confidentiality obligations; disclosures of confidential information mandated by law etc; parties to stop using confidential information upon termination; parties to return or destroy confidential information following termination; confidentiality obligations after termination. 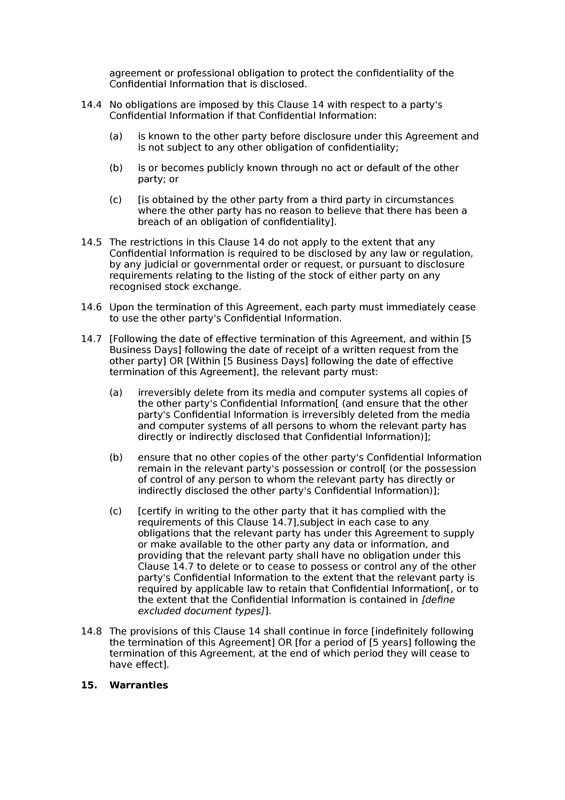 Indemnities: indemnity upon breach: any provision or specified provisions (with definition); conditions upon first party indemnity; indemnity upon breach: any provision or specified provisions (with definition); conditions upon second party indemnity; limitations of liability vs indemnities. Limitations and exclusions of liability: caveats to limits of liability; interpretation of limits of liability; no liability for force majeure; no liability for loss of profits; no liability for loss of revenue; no liability for loss of use; no liability for loss of opportunities; no liability for loss of data or software; no liability for consequential loss; child contract liability cap; aggregate liability cap upon services contract. 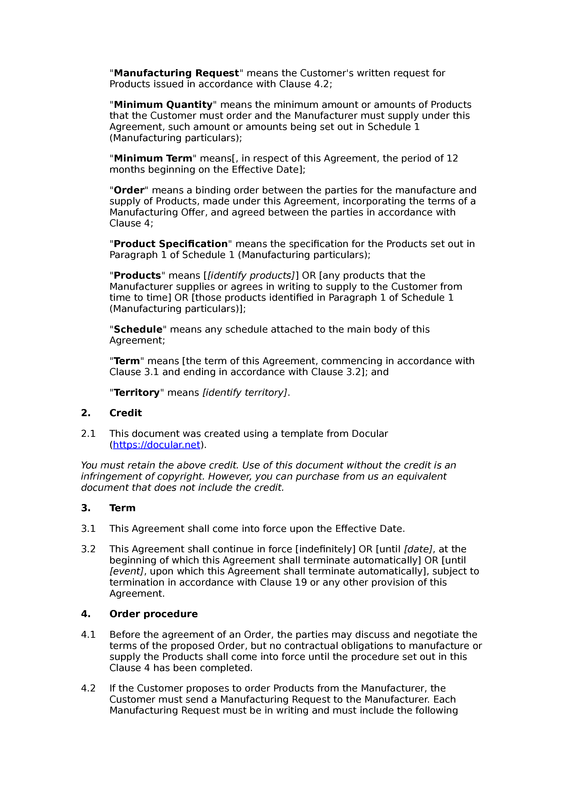 Specification of Products: specification of products prompt. Components: second party components prompt. Equipment : second party equipment prompt. 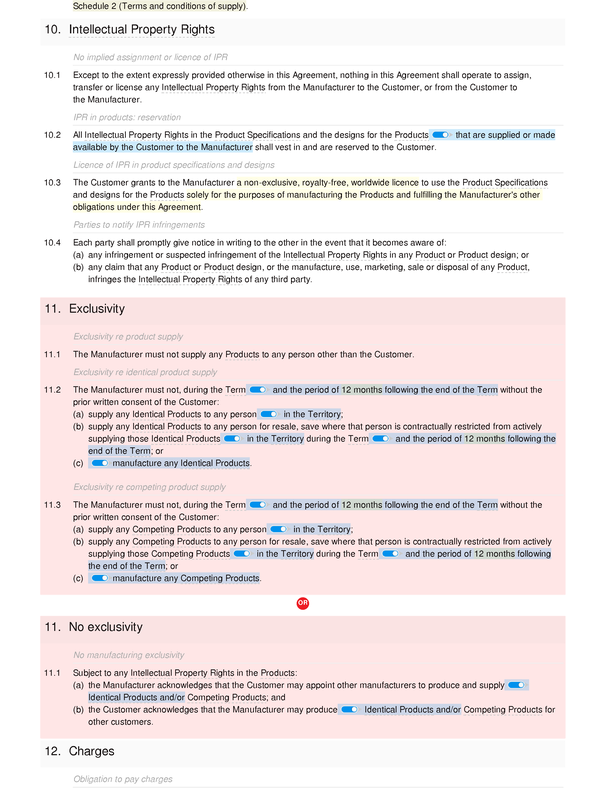 Preamble to terms and conditions (products) . Supply: products to be collected; products to be delivered; product supply by instalments; are product supply dates of the essence? 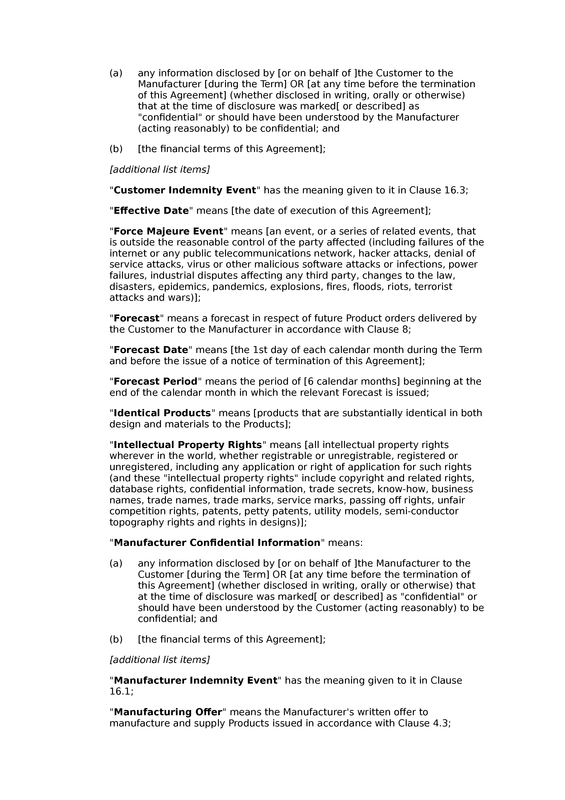 ; postponement of product supply. 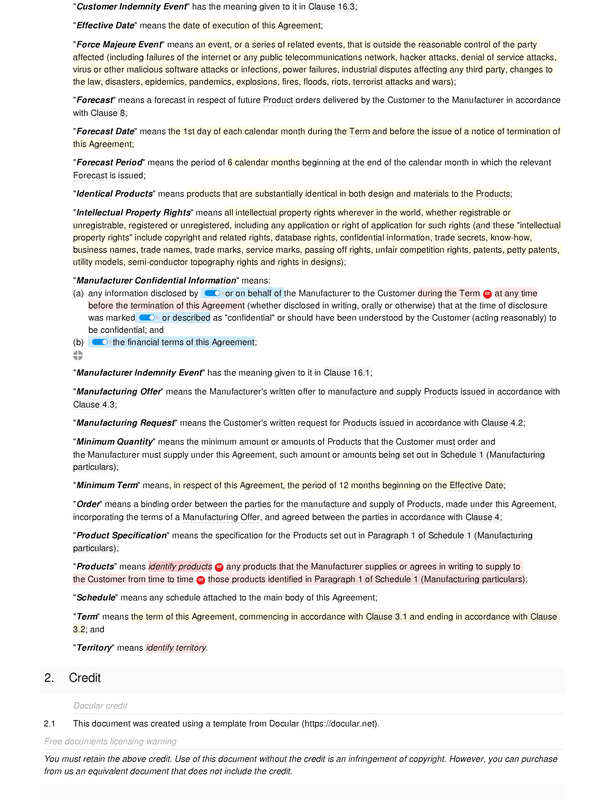 Title: passage of title to products; products held by bailee; obligations during title retention; recovery of products where title retained; action for charges notwithstanding title retention. 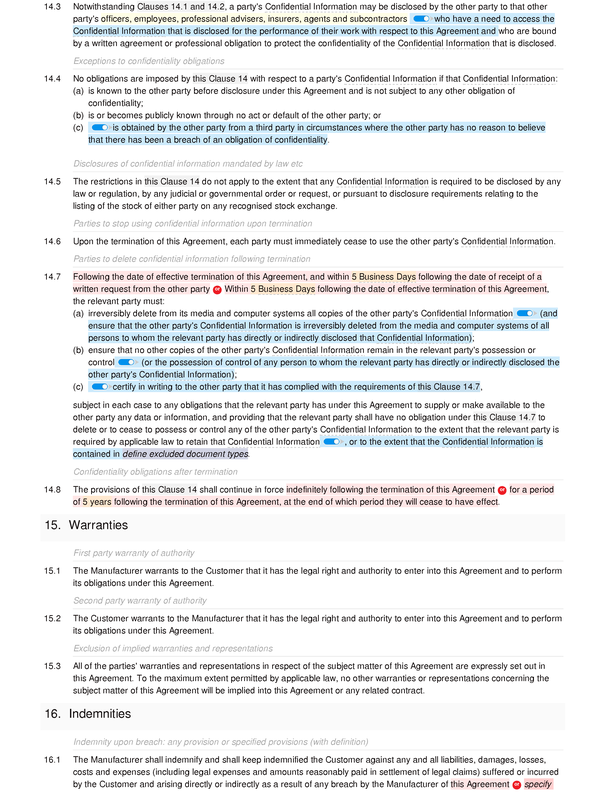 Warranties: first party product warranties; exclusion of implied warranties and representations. 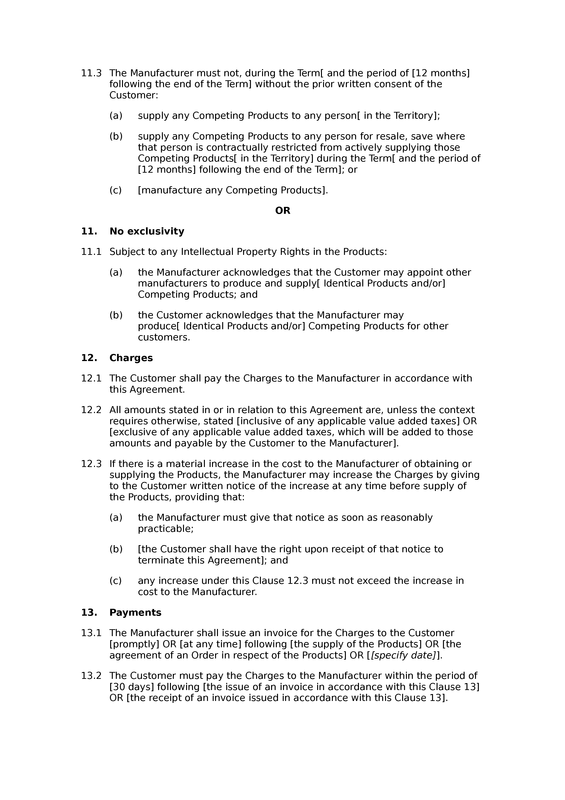 Breach of warranty: customer rights on breach of product warranty; procedure for returning products on breach of warranty.